We are fortunate to have been given access to a summary of the deeds made by Meg Wise of Thornbury Museum for 50 High Street in Thornbury. We have supplemented the information shown in Meg’s notes with details from census records, rate books and electoral registers etc. The earliest document in the deeds is dated 1689 and other documents show the ownership at various times during the 1700s. The present house was built by Samuel Penduck between 1802 and 1805. There had previously been a single house on the site now occupied by 50 and 52 High Street. In 1805 Samuel sold the two properties to Hester Hollister for £400 and she sold them to James Longman in 1821. Following his death in 1827 they were left to his children – in the case of number 50 it was left to Susan Partridge (alias Longman) who had become Susannah Bird by marriage. Click here to read about the earlier history. We have listed below the owners of the house, together with brief reference to any tenants known to have lived there since 1833. On 30th December 1829 Susannah Partridge (alias Longman) married Peter Bird of Chumleigh a druggist. The marriage took place at the Parish Church of Bow alias Nymet Tracey of Devon. On 21st February 1837 Peter Bird contracted to sell to William Grove, a cheesefactor, for £170. However there are several transactions indicating that William had to borrow money, involving George Wright, John Lamb and John Grove. It appears that William failed to pay all the money and this sale was never completed. On 30th June 1838 William’s creditors represented by John Lamb and John Grove sold this property and William Grove’s other properties, including the house later known as 2 St Mary Street in the process paying the Birds their share of the money. Thomas Winstone bought what is now 50 High street which was described as ‘Messuage late in occupation of Miss Ward since of Mr Wansborough now in occupation of said William Grove formerly James Gundry gent and Hester Hollister successively’. The land tax records from 1819 to 1829 show the house occupied by Elizabeth Ward. The 1832 land tax record shows the property owned by Susan Partridge was occupied by ‘late Elizabeth Ward now Mr Wansborough’. We suspect ‘Mr Wansborough’ was John Wansborough whose daughter, Jane, married William Palmer at the Friends Meeting House in Thornbury on 9th July 1834. Thomas Winstone – Thomas bought the property on 30th June 1838 from Mrs Susannah Bird for £183 6s 8d. Thomas was born on 11th October 1793 and baptised on 19th January 1794. He was the son of Thomas Winstone, a cordwainer and Unity (nee Cullimore). The 1830 trade directory shows Thomas Winstone as a boot and shoe maker in Thornbury. The 1841 Census shows Thomas was a shoemaker living at 50 High Street with Sarah aged 40. Thomas died on 29th December 1847 and his will dated 17th December 1847 was proved at Gloucester on 29th February 1848. Under the terms of the will his wife was allowed to remain in the house as long as she remained unmarried again, and on her death or remarriage the house was to be sold at public auction. He also made financial bequests to his sisters, Elizabeth Ashwell and Mary Winstone, and gave them the remains of the estate after his wife’s death. The 1851 Census shows Sarah still living there – she was described as an annuitant born in Yate. The 1861 Census shows her as a ‘Government Annuity’. We don’t understand why she was in receipt of an annuity. Sarah died on 19th September 1863 having not married again. The house was for sale and on 5th December 1863. It was described as ‘House late in possession of Sarah Winstone with productive walled garden planted with fruit trees, front parlour, pantry, kitchen, back kitchen with soft water pump and boilers, 3 bedrooms, attic, a good sized workshop with room over and underground cellar’. It was sold to Thomas Ford on 2nd February 1864. When the Darleys became owners of the property in 1975 they found the sign board shown in the photo on the right – reading ‘WINSTONE, Boot & Shoe Maker’ in the cellar of 50 High Street. It measured 3ft 6 x 2ft and on the right hand bottom the words ‘White & Pa…..’ were painted. Thomas Limbrick Ford – on 2nd February 1864 Thomas bought the property for £240 from the Trustees of the will of Thomas Winstone. Thomas was a saddler. Thomas was born on 11th February 1804 and baptised in Thornbury on 16th January 1805. He was the son of William Ford and his wife, Ann Limbrick. The 1841 Census shows Thomas was living at 21 High Street, just up from the Swan. Thomas was a saddler aged 30 living with Joseph Ford, a carpenter aged 25 and their mother, Ann aged 60 of independent means and their sister, also Ann a dressmaker aged 35. We believe that Thomas’s mother died aged 67 and was buried on 26th October 1847. In 1851 he was still there, unmarried a saddler aged 43 living with his brother, Joseph, now also a saddler aged 36, and their sister, Ann then running a fancy depository aged 47. The 1859 Rate Book and the 1861 and 1871 Censuses show he and his wife, Elizabeth were living further down at 24 High Street (now Heritage). The rate book shows that Thomas owned the property. The censuses show that he was now working as a glass and china dealer. Elizabeth came from Wickwar. We are not sure when or where Thomas and Elizabeth married. It doesn’t appear that Thomas or Elizabeth ever lived in 50 High Street. The 1867 Rate Book and the 1871 Census shows the house was occupied by Stephen Hignell. The census shows he was a retired farmer aged 81, his unmarried sister Eleanor Hignell an annuitant aged 77 and Mary Ford, an unmarried housekeeper aged 64 born in Iron Acton. Eleanor was buried on 7th October 1874 at the Congregational Chapel. The 1876 Rate Book shows Stephen still there. He was buried on 2nd January 1877 aged 86. The 1881 Census shows that Eliza Tanner was living at the house. She was a widowed annuitant aged 63 living with a servant Mary A Prewett aged 19. The 1885 Rate Book shows ‘S. H. Applegate‘ was the tenant of the property. Stephen Henry was a baker and flour dealer who had traded in a shop on the opposite side of the High Street. He died 3rd March 1887 aged 83. His wife, Mary, is shown as living there in the 1887 Rate Book and she died in 1888 aged 90. The 1890 Rate Book and 1891 Census shows Stephen’s widowed daughter, Charlotte Nelmes, took over the occupancy of the house. She was ‘living on her own means’ aged 57 and born in St Johns Wood, London. Thomas Ford died on 4th April 1872 aged 68 years. Under the terms of his will dated 21st July 1865 which was proved 9th May 1875 at Gloucester the property was left to his wife, Elizabeth. In the 1881 Census Elizabeth was living at 24 High Street and she was continuing the business of china dealer. Elizabeth’s niece, Emily, was also living there with her husband, Thomas. Elizabeth died on 15th June 1887 aged 78 years. On 5th January 1887 Elizabeth left the property to her niece, Emily Anstey. We don’t think that Thomas and Emily Anstey ever lived in 50 High Street. Initially the house was let to Charlotte Nelmes (see above) and then in 1894 James Merrett Michael was the tenant there. James was the previous owner of the pub against the road which for a time was called ‘Michaels’ but better known as The Exchange and now Knot of Rope. By 1899 Laura Symes was the occupant. Laura was the widow of Bernard Symes. She was still living there in the 1901 Census with her unmarried daughter, Annie and in the 1905 Rate Book. Emily Anstey died on 18th April 1921 aged 70. Under the terms of her will of Emily Anstey dated 1st August 1919 she arranged that the income from 50 High Street (then occupied by Sidney Gayner) should be given to her husband, Thomas Anstey, during his lifetime and then the property would be given to her daughter, Emma Jane who had married John Godfrey Taylor in Thornbury in 1908 . Thomas Anstey died on 26th December 1920. Emma Jane Taylor died aged 43 on 10th January 1927 when she was living at 621 Gloucester Road, Horfield, Bristol. Letters of administration were granted on 3rd February 1928 to convey 50 High Street to her husband, John Godfrey Taylor, a chartered accountant. The 1911 Census shows the house was occupied by Jane Ann Walter who was a certified nurse and midwife. She was a widow aged 59 from Forfar in Scotland. She was living there with her daughter-in-law, Bertha Stephens aged 26 and grandson, James Stephens aged 2 who was born in Dursley. The 1914 Prewett’s Street Directory shows that Jane had moved away and we assume she was replaced by Miss Higgs who was listed as the District Nurse. William George Symes – on 11th February 1932 the property was conveyed from John Godfrey Taylor to William George Symes of Thornbury for £315. We know from the 1925 Valuation List and 1926 Rate Book that William was renting the property from the Representatives of the late Emily Anstey. William was a highway surveyor. He was born 5th March 1879, the son of Gilbert Symes and his wife, Eliza (nee Moon). On 12th October 1904 William married Lois Hedgland Cooper in Thornbury. She was the daughter of Charles Radcliffe Cooper, a station master at Thornbury Station. At the time of the marriage William was a grocer’s assistant. They had two daughters, Cicely born in 1907 and Rhoda born on 15th April 1910. William and Lois moved around a little bit immediately after their marriage. The 1907 Voters shows William living in Castle Street. The 1909 Prewetts Almanac and 1910 Voters List show that William was living at ‘The Baths‘ in Bulls Eye Lane (now called Bath Road). The 1911 Census shows them at 21 Pullins Green. The 1913 Voters List shows him living in St John Street. The Western Daily Press of 26th January 1914 reported that William had had an accident whilst cycling near Filton Hill and was taken to hospital. Interestingly his address was said to be “Coles Dental Surgery, Thornbury”. We have details of a property sale dated 21st May 1919 referring to a house in the High Street occupied by ‘W. Symes’ at an annual rental of £15. The house was described as having two front sitting rooms, kitchen, back kitchen, cellar and 4 bedrooms. We believe that this house must be 52 High Street because we think that ‘W. Symes’ must refer to William George Symes, because the deeds of the house show Lois Hedgland Symes as being the tenant in 1920. William and Lois are also listed as living in the High Street in the 1921 electoral register. On 28th June 1923 the Gazette reported that William had applied for an increase in his wages for his job as assistant highway surveyor. He was earning less than £3 per week. The Council rejected his application. The Gazette in May 1927 reported William had had an accident on his motor cycle when driving in Severn Beach and as a result broke several ribs. The motor cycle was practically undamaged. On 16th October 1933 Rhoda married Ernest Frederick Ball the son of Frederick Tom Ball, the licensee of the Royal George, and his wife, Alice Eliza. On 5th July 1943 Cicely married John Maurice Augustus Chambers in Penzance (see below). We understand that Cicely told the Darleys who lived there later that the separate building at the back, (which presumably had been used by the Winstones as a workshop), was used for some of the time as accommodation for the family’s domestic help. A wooden plaque in the Tower of St Marys Church shows that ‘W. G. Symes’ was the ringer of the treble bell when the B. B. C. broadcast the Thornbury bell ringing on all its programmes on Christmas Day 1946. In 1932 William had borrowed £250 from the Thornbury Permanent Benefit Society to buy the property and a further sum of £65 was borrowed from Doris Smith of the Hackett. William had difficulty paying them off. He finally conveyed the house to Cicely on the basis that she would settle the debt. However William and Lois continued living at the house until they died, Lois on 23rd October 1956 and William on 27th December 1972. It is interesting to see a letter from Thornbury Rural District Council written in 1973 which confirms that the property then known as 50 High Street was known as 83 High Street in 1937 and that it was given the new number in 1953. Cicely Chambers – on 16th February 1937 the house was conveyed by William George Symes to Cicely Symes. She appears to have acquired the property by agreeing to pay off the outstanding loans. Full repayment was acknowledged by both the Thornbury Permanent Benefit Society and Doris Smith in 1944. Cicely was born in 1907, the eldest daughter of William George Symes and his wife, Lois Hedgland Cooper (see above). The Post Office online archives show that Cicely became a telephonist in their Bristol Exchange in August 1925 and she is still listed in that capacity in 1927. The 1931 and 1933 records show Cicely as a ‘Wtg Asst’ which we assume to be a wireless telegraph assistant. She was noted as working then in P.O. Stores. On 5th July 1943 Cicely married John Maurice Augustus Chambers in Penzance who was 26 years older than her. Maurice was the son of John Taylor Chambers who owned Rosemount, the large house at the entrance to Thornbury by Daggs allotments. Both John and Maurice were organists and played regularly at the local churches. Apparently Maurice was very noticeable in Thornbury driving around town in his yellow convertible Rolls Royce. He regularly drove to Scotland to join in the shoot. He put his dogs on the train and collected them at the other end. Cicely was in Cornwall working as a clerical officer for the Foreign Office. At the time of the marriage she was living at Zaribo, Portminster, St Ives. Tragically Maurice was to die within about a year of the marriage. The records of the Post Office archives indicate that in 1946 Cecily was listed in the Appointments Book as a clerical officer in the Stores. We cannot explain how this information fits in with what we have been told about Cecily. We understand that she carried on with her career in the Foreign Office, embarking on several trips abroad. We understand that she reached very high status within the Foreign Office becoming Vice Consul of Macao. The family photo album for the Chambers family has copies of two documents dated 1957 and 1968 showing Foreign Office appointments. Click here to access these photographs. During this period she retained her home at Rosemount, but she also a flat in London and was stationed abroad for periods. 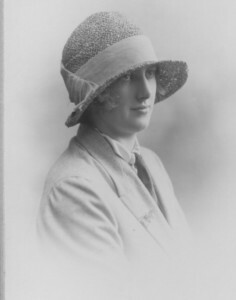 Cicely died in 1995 in Thornbury. On 28th July 1975 the house was bought by Philip and Pauline Darley.